Last Friday night, I found myself in a sun filled loft workshop in Leeds. All the people in the room seemed to be in one corner, but that’s where the (free) bar was. Tables are set out in rows. Solid wood and rubber topped refugees from the re-fit of Birmingham library. They are already filled with laptops. This loft space belongs to the ODI’s node in Leeds The laptops belong to data scientists but the people are a mix of the data savvy, local and national charities. All here for the first, it’s hoped of many, DataDives. The event was organised by DatakindUK, a chapter of the US group Datakind who “create teams of pro bono data scientists” to work with organisations to solve problems. Local charities are invited to pitch requests for help. If selected they provide data which ,in the run up to the event is cleaned up by data heroes, ready to be pitched at the start of the weekend. Local organisations also pitched in data. Leeds City Council and their DataMill, for example, had offered up data to use. So, after beer and chat, the three charities pitched their problems. Volition, representing a large network of mental health organisations in Leeds, had a common problem. Lots of information about the organisations and their work (literally a database of the stuff) but wanted to link it with data about mental health issues in Leeds. Voluntary action Leedshad stacks of interviews with young people, exploring the issue of being a NEET (not in employment, education or training). They wanted a way to sift the text to look for common themes and also wondered if there was a way of detecting unknown Neets in existing demographic data. The Young Foundation (who also co-sponsored the event) have recently set up a new project in Leeds gathering information around financial exclusion. The project, part of a broader range of projects Leeds are running, looks at the growth of loans, payday lenders etc. They wanted to surface data around the issue. The rest of the evening was a kind of slow-speed-date where the volunteers in the room pitched themselves and their skills and where wooed by the charities. Eventually splitting into teams to get to work on the Saturday and Sunday. That more isn’t just the pro-bono aspect – free data scientists. 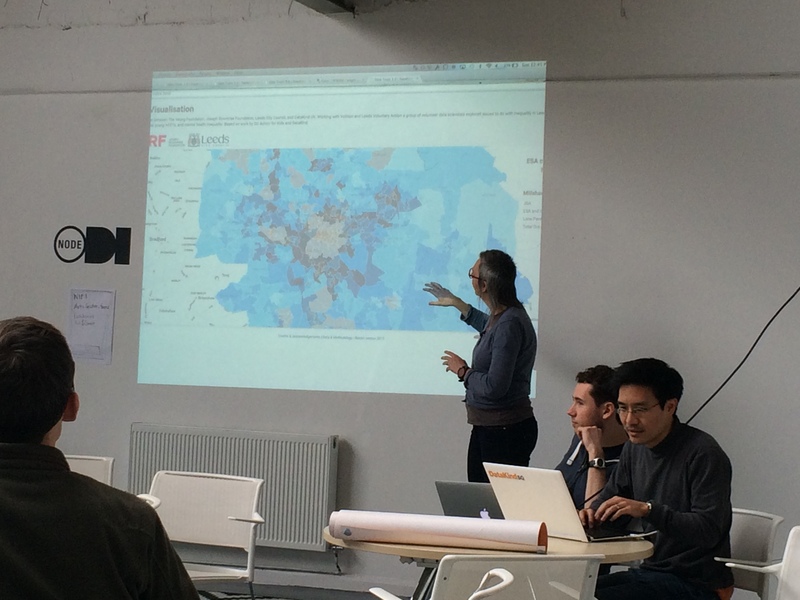 The Datakind people in the room are also there to pass on skills to the organisations. It was great to see the charities getting excited about the possibilities of everything from simple tools like Wordle to more complex text analysis software and maps. Sunday afternoon and it was time to show and tell. The end results where a real mix of the complex – synthetic personality types for identifying the financially excluded – to simple infographics. But there was real impact in the data on the people in the room perhaps best exemplified by the debate and discussion that was generated by an extra mapping project that sprang up during the weekend. They simply took the datasets each group were finding/generating and mapped them. Technically, not that much of a challenge (except for a tricky issue with local government boundaries) but the insights where immediate. When I spoke to representatives of the charities, there was a general feeling that data was important. They all recognise that the third-sector is fast becoming data-driven. But beyond the process of writing reports or bids, the real value of data was still to be explored and understood. It just feels important. The complexities of the third-sector ecosystem don’t help when it comes to raising awareness of events like this though. Even when free help, and experience is on hand. When I asked people about how they found themselves at the event, it revealed a complex web of umbrella groups, agencies and initiatives – understanding that would need a datadive in itself! The organisers where similarly challenged; pulling the event together had proved a slower and more complicated process compared to their London datadives. After the ODI summit last year, I found myself reflecting on the difficult line there is between the power to do good and the power to do business that data provides and after the event I found myself chatting through similar issues with Paul Connell, one of the founders of the ODI Leeds node. He was pragmatic about the challenges; balancing the urge to do good with the urge to create the new Uber. A tension that often makes hack events tricky spaces. So, with my research hat on, its tempting to start try and unpick the motivations of activities like this beyond the desire to give those people involved “the warm fuzzies” as Datakind put it on their homepage. 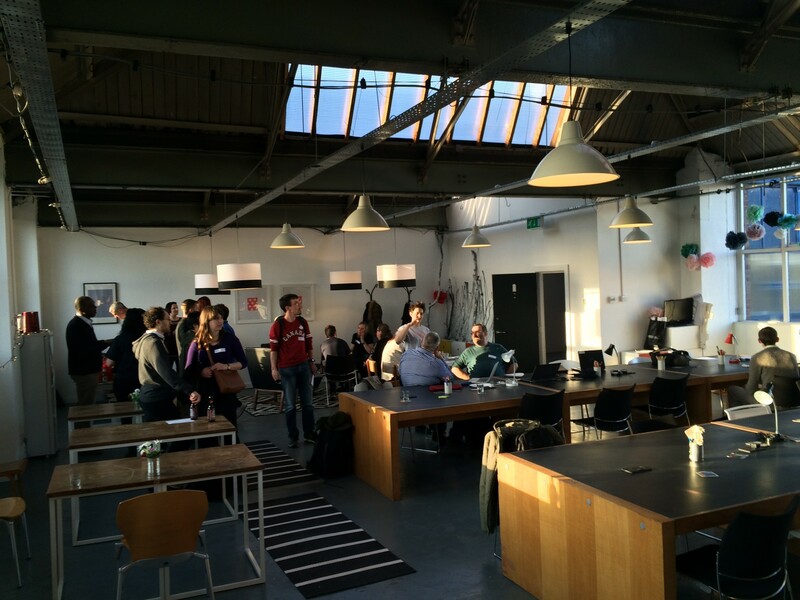 But the vibe at the Leeds Datadive event really did make it feel impervious to scepticism. The results, rough round the edges as they were, felt ‘useful’. As an example: One of the teams, analysing data around NEETS, looked at sanctions imposed on young jobseekers (the stop in benefits that’s imposed if you don’t tow the line with your employment service). Sanctions vary, but you can get 4 weeks ‘ban’ for missing an appointment. Mapping the data seemed to make a compelling point – the most sanctions were applied to people who live furthest away from the job centres. That peaked a fair bit of interest from journos in my feed (even on a Sunday morning). Whether further analysis proves that or, more likely, reveals the finer detail, is moot. In a short space of time, simple but no less surprising truths about the experiences of people in Leeds were revealed. DatakindUK hope this is going to be the first of many events outside of London and I’d make a point of tracking them down next time.